Recycler Van Dijk Containers is located in the carpet city of Genemuiden, on the Zwarte Meer inland sea. The company sees itself as a professional environmental center where all types of waste can be disposed of: building rubble, paper, green and garden waste, plastics, wood, carpet and textile waste, glass, asbestos, and residual waste. 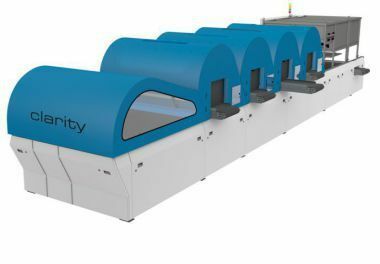 This certified recycler‘s customer base consists both of companies and private persons. All waste flows occurring are sorted and processed to varying depths, depending on the particular material. An „environmental line“ has been set up for the general public. The method used is as simple as can be: vehicles entering are weighed on a modern scale and the drivers can themselves distribute their waste to the appropriate waste types. After unloading, the vehicle is weighed again, and the weight difference determines the fee to be paid. The Van Dijk company is more than 100 years old! Around fifty persons now work at three depots, the main site being located at Genemuiden. Van Dijk is a specialist in the further processing of fitted carpets. Recycling of carpets has now become one of Van Dijk Containers‘ core activities – the company is by far the largest player in this field on the West European market. Genemuiden is known, among other things, as Europe‘s „carpet city“. The carpet industry located in the town was looking for solutions for the disposal of production waste, and therefore contacted Van Dijk Containers. Processing of the frequently very long fibres proved to be an insoluble problem at the waste landfills, since they could not be routed in this form to the incineration plants. 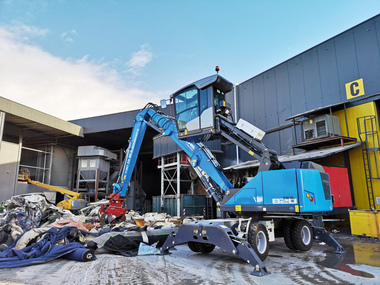 Van Dijk Containers found long-term, sustainable solutions for its customers, in the form of a shredder developed specifically for this application, and a baling press. The company now serves the international carpet industry, supplying its products to customers in the Benelux countries, Germany and France. Van Dijk Containers completely reprocesses the yarns contained in the carpets, and also other constituents. This produces a fluff material of R1 status which can be used for a number of applications. A significant portion of the recycled carpets is delivered to the Dutch and German cement industries, where it is used as a fuel and as an additive in the production of cement. Another secondary feed material yielded in the sorting, pressing and processing of carpets is supplied to the automotive industry. Recyclate from Van Dijk Containers is used in many cars as insulating or padding materials for the vehicle‘s seats. Such products are also used as winding material in drainage pipes, for highway construction and for the manufacture of clothing. Research into the recovery of polypropylene is currently also proceeding at full speed. This would even enable the carpet industry to re-use certain recyclates in production. Such recyclates are already in use as the input material for the production of flower pots and garden chairs. 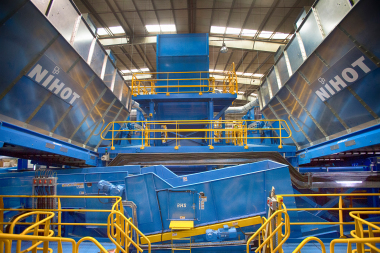 During ongoing operation, a total of five FUCHS materials handlers are used, for sorting of materials, for example, to feed the shredder and for handling of the secondary materials. The first – an MHL 320 – was purchased as long ago as 2004. The MHL 320 has a power output of 95 kW, and can thus move up to 10 t, or 0.6 m3 using its light weight grab. The driver‘s cab can be hydraulically repositioned infinitely finely up to a height of 5.3 m, providing a good overall view for the machine operator. Van Dijk subsequently purchased another three FUCHS Type MHL 320 materials handlers. The fifth FUCHS materials handler followed in December 2018. This machine is used for charging the carpet shredder. Only limited mobility is needed for this task, thus making it rational to use the MHL820. This, with a cable length of 30 to 50 m, is precisely suited for use where only limited mobility is necessary. The zero-emissions electric motor generates a high torque, emits only low noise and heat levels, and can therefore also be used in large industrial buildings. Another benefit of this maintenance-friendly propulsion system are low operating and servicing costs. The electrohydraulic propulsion arrangement means that the full torque is available at all times, since a corresponding power supply is, anyway, installed in the recycling facilities, in view of the use of recycling machines such as shredders and presses. Oil changes, servicing of the moving parts of a diesel engine and refueling are all no longer necessary – and this increases the pure working time for which the machine is available. And if it does have to be relocated and cover longer distances, the power-pack – a diesel set – supplied with the machine permits this without difficulty. All the electrical variants of the materials handlers were conceived at the FUCHS Application Center (APC). In cooperation with the APC engineers, machines can be optimised in such a way that they are a „tailored fit“ at the necessary deployment location.